Force 2 Review Rating: The ‘Force 2′ movie, latest of Bollywood releases this Friday (October 18, 2016). It stars John Abraham and Sonakshi Sinha in lead roles along with Tahir Raj Bhasin while Genelia D’Souza has a cameo (Maya). Paras Arora and Narendra Jha are the supporting actors. 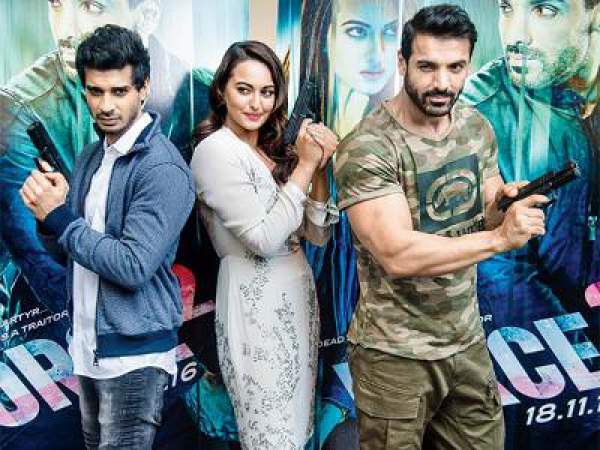 The Force 2 comes with fierce action sequences and enough to make audiences’ day. The action performances are well executed by the lead actors, but they lack with their on-screen chemistry as it is not so engaging. Another Bollywood flick to release this Friday is Tum Bin 2. Directed by Abhinay Deo, Vipul Amrutlal Shah has produced this action thriller under the banner of Sunshine Pictures Pvt. Ltd., Viacom Motion Pictures, and JA Entertainment. You will have to watch the rest of the story as it forms the crux of the storyline. On the whole, the story is the fight between Indian intelligence agency RAW (Research and Analysis Wing) and a terrorist mastermind responsible for carrying out deadly activities across the nation. The sequel picks up the story from its previous part and stars John as the same old ACP Yashvardhan aka Yash. The new part has Sonakshi as KK aka Kamaljit Kaur. Keeping their dislikes apart, the duo team up to capture Shiv (Tahir) who plans to kill Indian Prime Minister. They get the mission to capture him dead or alive before he executes his mission. In the meantime, they fall in love and at the same time, they eliminate the antagonist. The sequel is more fierce and well made if compared to its previous part. The connection between the stories could have been better. John is leading the story and making command at every point in spite having Sonakshi as his senior officer, and that is grating. Sonakshi appears to be just over a decorative piece in the movie. F2 is simply straightforward, but the blend of action and romance didn’t go well. It feels unbearable at a few point of times. Rest of the Force 2 is okay having a decent flow and exciting sequences. One of the car sequences is very well executed. It is a delight to watch for John and Sonakshi fans and action lovers. John has nailed the character of ACP Yash, and it is expected to invite a good word of mouth. John has done an incredible job while executing his role and thus, has overshadowed the work of other actors. While, Sonakshi is working to redefine her image as an action girl from a bubbly girl. She has tried to perform good whenever got a chance. Tahir as an antagonist has presented an incredible performance. The rest of the star cast have been good and helped the film to flow in a proper manner. Force 2 has got a good direction. Putting romance part in it has proved to be a bad idea. It could have been integrated in a better way if needed to. The music of the movie is average. The cinematography is excellent, and selection of locales have done a great job in making Force 2. Rest of the technical elements are okay and somehow added value to the entertainment. TRT gives F2 3.5/5 stars. The film should be appreciated for choosing counter-terrorism as its central topic. Action lovers would love to watch this spy thriller. The star performances certainly add value to it. But, how does John kept his bath towel tied securely while fighting baddies? Have you watched the movie? Don’t forget to add your Force 2 review and rating.